There is a Singer sewing machine for every kind of sewer, from beginner to professional, and for every sewing requirement, from garment construction and embroidery to home décor and accessories, including quilting. To help you make an informed decision on what Singer sewing machine model is ideal for your particular needs, here is a selection of three of the most popular Singer sewing machines: the 7258, 9960, and 4423. 1,100 Stitches per Minute - Extremely Fast! 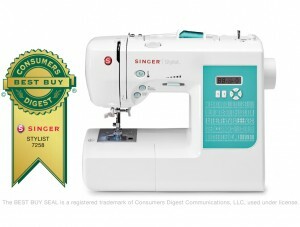 The Singer 7258 Stylist sewing machine has a hundred stitches built in its heavy duty metal frame for use in crafts, home sewing, quilting, and heirloom, accessories, décor, and fashion projects. To compliment these unique stitches, the 7258 has 10 presser feet inclusive of accessories such as an all-purpose foot, and feet for zippers, buttonholing, blind hems, satin stitches, darning, embroidery, gathering, quarter inch, rolled hem, and overcastting. A screwdriver for the needle plate. Instruction manual in English, Spanish, and French. Click here to read my full review of this sewing machine.Like other Singer models in its computerized and/or digital line, the 7258 has an easy system for threading with its automatic needle threader, a backlit LED display equipped with an automatic indicator for stitch width and length, and a clean-covered, drop-in, top bobbin system that’s easy to load. The 7258 also has an electronic automatic pilot feature that allows you to sew without foot pedal use at an easily adjustable maximum speed. Just as you thought there couldn’t be any more sewing machines with hundreds of stitches to choose from comes the Singer 9960 Quantum Stylist sewing machine with 600 built-in stitches that include 13 fully automatic, one-step buttonholing styles and five font variations! This model even has an extension board and bonus accessories to take your sewing creativity several notches higher! The 9960 allows you to edit any stitch you make to replicate a pattern’s exact look with its mirror imaging and elongation capabilities. Set up is easy with its automatic needle and drop-in top bobbin systems so you can start sewing immediately. And after the completion of each task, the one-touch thread cutter automatically trims or cuts upper as well as lower threads to save you time. Precise and error-free sewing any time and every time is possible with the 9960 because of its electronic speed control and automatic pilot to provide you with total control of how fast or slow you want to sew. The detachable free arm provides even greater access to hard-to-reach areas such as pant hems, collars, and cuffs. All stitches of the 9960 are set automatically with its optimum settings for stitch width and length but you can always override them if your creativity takes over. The Up/Down Needle Button does what you want with the needle’s position – up to down and vice versa – while the box feed motion of the feed dogs do your bidding for monograms, button sewing, and free motion sewing or embroidery. Here’s more good news for those who think marathon sewing is leisurely: the 9960 has two StayBright LED light bulbs that illuminate your work space to last 100,000 – yes, you read that right! – sewing hours. And the large LCD screen is back-lit with brightness control for clear viewing of all stitch functions such as tension settings, presser foot, and width and length for flawless sewing. What the Singer 4423 Heavy Duty Extra-High Sewing Speed Sewing Machine lacks in stitching options is compensated for by its heavy-duty, metal frame interior, powerful motor, and bedplate of stainless steel. 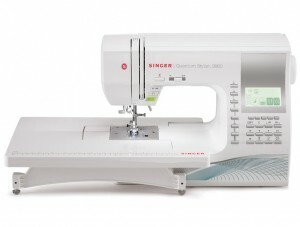 With its über-fast sewing speed, the 4423 is durability and reliability at its best. Whether it’s a garment alteration you need to do or start something from scratch, the 4423 is your best bet. It lives up to its “heavy duty” description with its rate of 1,100 stitches per minute (SPM) for any kind of fabric you work on, from burlap canvas to denim to leather. To save you even more time, the 4423’s automatic needle threading and automatic drop-in, drop-feed, and top bobbin systems ensure that you get precise, clean, streamlined sewing each time for any project you do. The 4423 may only have 22 built-in stitch options but these are more than enough to get you through any craft, quilting, clothing, home décor or accessory that you make: six basic stitches for mending and constructing garments, four specially-designed stretch stitches that move with any kind of fabric, and a dozen stitches of the decorative kind for you to use when the creative mood hits you. 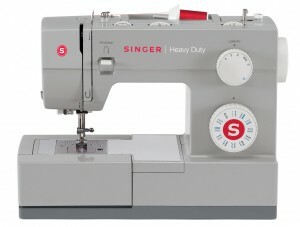 This workhorse of a sewing machine has the unique feature of a bed plate made of resilient stainless steel to provide a smooth feed to fabrics for sleek, easy, and even sewing. And, as mentioned, its metal frame has been constructed into rock-solid excellence to ensure that your sewing does not skip or wiggle even when you use its three-needle changeable positions for zipper insertion or cording. Click here to see reviews of other heavy duty sewing machines.With the extra-high lifter in its presser foot, the 4423 gives you a whole lot more clearance whenever you place multiple layers of even the bulkiest fabrics under it. And speaking of the presser foot, sew projects with the lightest of weight tricot to the heaviest denim without having to make adjustments to the pressure feet with its automatic exerted pressure on fabrics against the machine’s feed dogs. If you are looking for a digital model then you might want to look into the Singer One Plus sewing machine or if you are looking for a heavy duty unit check out the Singer Confidence 7470 which we have also reviewed on this website. But if you are a newbie and looking for beginner models then go to this link.